Driving down to the Falmouth’s Artists Guild on Friday, I wondered what I had gotten myself into. Encouraged by my friend Carol, I had agreed to pose for a figure drawing class. 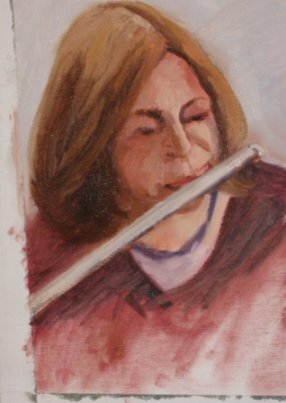 Carol is both an artist and a cellist and had recently posed for the group while playing her cello. 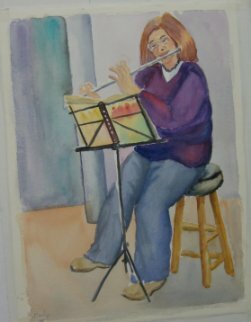 I offered to play flute, but I was a little nervous about the whole thing and wondered what the finished paintings would look like. As an occasional artist myself, I have drawn both flute and cello, and I like exploring ways of making the flute look shiny and the cello look rich and resonant. So I appreciated that it might be fun for artists to draw instruments, as well as the people holding them. 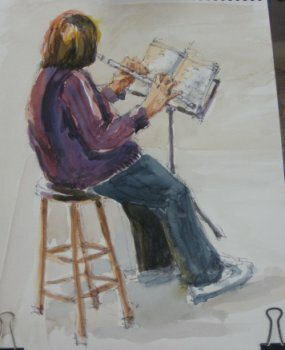 What was also interesting about this 2.5 hour figure drawing session was that I was going to actually play the flute, not simply hold it. I was also a little worried about what my flute playing would sound like, but figured it would be a good way to get some practicing in! I was a little nervous, but the artists in the figure drawing class were all friendly and kind–and talented, and we got underway. Drawing sessions were 10 minutes long, followed by a break of a few minutes, during which I could stretch, drink some water, and run around photographing the artwork. I also enjoyed playing the flute for my captive audience. I started with the first flute part to selections from Haydn’s London Trios, which seemed to work fine, despite the missing second flute and cello. Then I played Marcello’s Sonata in F for flute (getting some applause for the first movement! ), and then I turned to a book on slow airs from Ireland. I have not played much from this book, but it has a wonderful assortment of tunes, slower, lower, and more meditative than the classical music. There are some tricky rhythms, but this is not really a problem with slow airs, as it is entirely appropriate to take liberties with tempo markings and note durations when playing solo. by Ruth Leech, an early version of her painting, but I like the way it looks. by Nick Vardack (whose other work is on display at the Cape Galery Framer, on Main Street, Falmouth). This one looks the most like me. by Marguerite Miller, who did a great job on a back view. 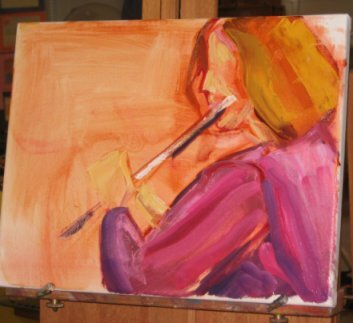 by Sigrid Hecker, who eliminated the flute entirely. I like the colors. by Noreen Greetham, in watercolor. 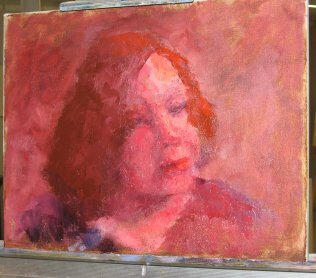 I like this one a lot and am happy to say that Noreen has promised to give me this painting when it is finished. Ruth Leech told me that the class has been ongoing for at least four or five years, with many of the same people in attendance. If they do not have a model for a class, they take turns being the model and sometimes do group scenes with three or four people in the group, while the alternate group paints, giving them all an understanding of what it is like to model. The class meets outside when it gets warm. In the past they have met on the Library lawn or the Falmouth Historical Society lawn. Ruth said, “They are delighted to have us there and it is a pleasant venue.” This summer/spring, the class may meet at both locations, as well as at Highfield Hall. Friday Figure Group is a drop-in class, which means you don’t have to pre-register or pay in advance. 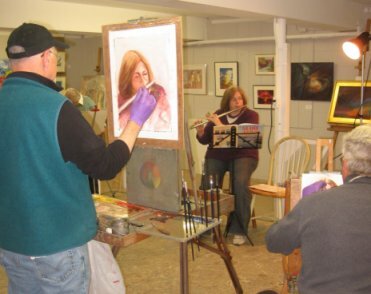 Just show up on Friday at 9:30 AM with your easel and equipment and be prepared to draw or paint until noon. (Call first to make sure there is a class in session.) You don’t have to be a member of the Artists Guild, though, of course, regular attendees are encouraged to join. The fee is $10 per session, payable at the class. 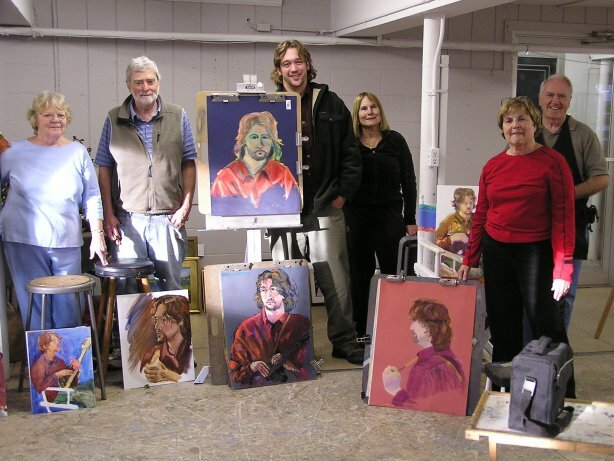 If you are interested drawing/painting or in modeling (models are paid $30 per session), contact the Falmouth Artists Guild online or at 508-540-3304. Here are the results of another class, when local musician Matt Beninghof posed last fall. Matt is an accomplished mandolin player and performs with his brother, John on guitar, and Charles Walton on drums as the Old Silver Band. Click on this photo to make it larger. The Old Siver Band sounds great on their MySpace page, and you can hear them in person at the Courtyard in Bourne on Saturday, May 10. In the photo are: L to R, Virginia Fantarella, David Kelley, Matt, Linda Peterson Pollen, MaryAnn Robb, and Bob Ryder. Note: This photo and the first one were taken by Ruth Leech. Others were taken by me.